When I look at this poem I can still remember the thoughts going through my mind when I wrote it… I was apprenticing Wallace Stevens as part of a poetry writing course and I was struggling with his subtly. By the end of my studies with his work it was clear that we may never write on the same wavelength. 1. The title is one of those ‘on’ poems that you will see throughout my collection… it might have been relevant for several works but not whole chapbooks… ‘on’ became a titling crutch for me. Discover your own crutches and identify them. By knowing what we lean on we can become more conscious writers, which is the whole point of poetry. 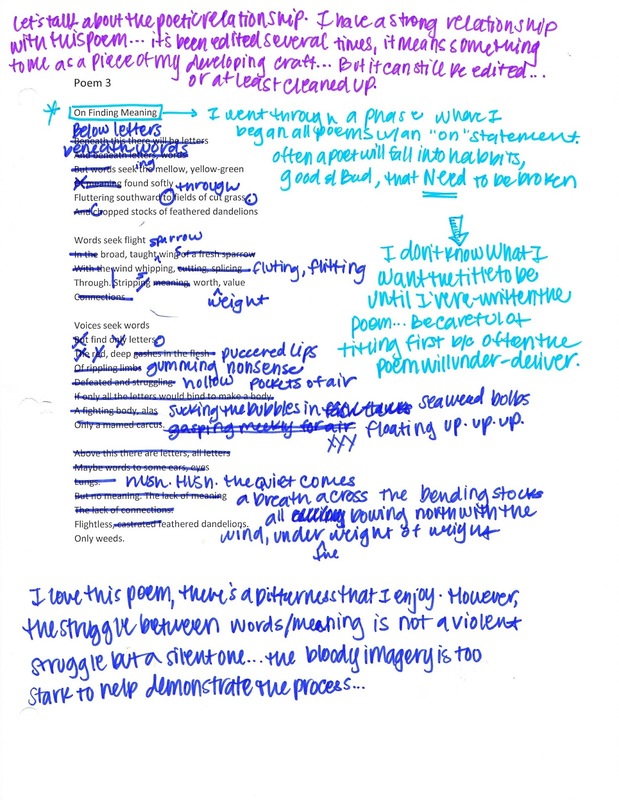 In this poem, the issue of finding inspiration is overshot with visceral violence that fails to portray the journey… in my notes I describe the struggle as a silent one rather than a violent one… keep this in mind… make the words and the cadence of your work both equal partners in a poetic piece. This poem, though I loved the earlier draft, needed some serious work. Remember to keep an eye out for the pitfalls you recognize in your own writing and edit edit edit… Breaking your own habits is key to developing new skills… good or bad a habit can become a crutch, and a crutch will limit your potential every time… Instead of habits, develop rituals; unlike habits that are stationary (like my verbal tick for titling ‘on’), rituals like editing or handwriting or retyping or inverting poems are part of a process. These lead to better final pieces. This blog is my ritual, by editing I can break those habits that I’ve picked up over time… what will yours be?